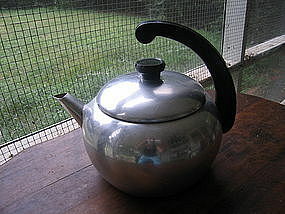 Aluminum tea kettle with the bottom stamped Wear-Ever Centennial Made in USA 4 Qts. There are no dents and the interior is in a usable condition. It is a work in progress, as far as the exterior finish goes. I've been working on it for a long time. Years ago, when I bought it, someone had taped it together and left it way for a long spell. I've safely removed the tape, but really needs a good polishing. Additional photos or info by email. I need your zip code to calculate the postage. Note: The blue spot in the center, is my reflection, not damage.